the exemplar, of course, being Batman. But Batman wasn't the first — in fact, when he debuted as the cover-featured new star of Detective Comics, another rich guy with a mask had been running in that title's back pages for months. The Crimson Avenger, DC Comics' first mask-wearing hero, debuted in Detective Comics #20, October, 1938. Not that Crimson (as he was addressed) didn't have antecedents in popular fiction. Wealthy evil bashers with secret identities go back to Zorro, The Scarlet Pimpernel and points beyond. In fact, The Crimson bore an uncanny resemblance to an already popular radio hero, The Green Hornet. The Hornet was newspaper publisher Britt Reid. Crimson was newspaper publisher Lee Travis. The Hornet had a Japanese chauffeur, sidekick and confidant named Kato (whose nationality became Filipino after Pearl Harbor). Crimson had a Chinese chauffeur, sidekick and confidant named Wing. Both wore color-coordinated cloaks, slouch hats, masks, etc. to conceal their identities. Both were themselves suspected of criminal leanings, at least at first. Crimson, in fact, once had his newspaper post a reward for his own capture. The Crimson Avenger was created, or at least cloned, by cartoonist Jim Chambers (who had credits at Fiction House, Dell and elsewhere), but was handled by several writers and artists over the years, none of whom particularly stand out. He appeared on the Detective Comics cover twice, #22 (December, 1938) and #34 (December, 1939). #34, by the way, was the last to feature any character but Batman. Thus superheroized, Crimson's fortunes became tied to the superhero genre. When the superheroes started fading, so did he. His last adventure on his own appeared in Detective Comics #89 (July, 1944). The Seven Soldiers last appeared in Leading Comics #14 (Spring, 1945), and with that, The Crimson Avenger was gone. But DC characters generally don't stay gone forever. There was a faux revival in 1963, when Superman and Batman met a new character by that name. But this one was just a crackpot inventor, trying to turn his devices into crime-fighting tools, and he gave up after a single appearance. It was almost another decade before the real revival. In 1972, the whole group turned up in an annual crossover between The Justice Society and its later counterpart, The Justice League of America. Since then, its various members have been out and about in the DC Universe, not exactly stars, but still keeping their hands in. Except Wing, who was killed off in the set-up to the story that brought them back, and Crimson, who was killed off a few years later. Before they offed him, tho, DC took the trouble to give him two mutually contradictory origin stories (possibly to make up for the fact that they didn't give him any at all during his original run). Between them, these stories managed to touch on the Spanish Civil War, Superman, the Mysteries of Tibet, The Sandman, Deadman, the Orson Welles version of War of the Worlds, Johnny Thunder and other disparate elements of history, popular culture and DC comics. As comic book characters go, The Crimson Avenger seems to be fairly reliably dead. He was buried a couple of decades ago, and the fact that he's long been among the departed is a well-entrenched part of the DC Universe back-story (he's now regarded within the stories, if not the outside world, as the guy who, directly or indirectly, inspired all subsequent masked do-gooders). 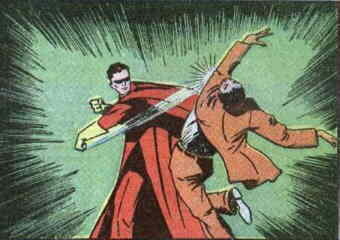 Still, The Comet was shot several times in the gut, then died right before the readers' eyes, and his death inspired the entire superhero career of The Hangman. And they still brought him back decades later. So with superheroes, you never really know. Text ©2002-10 Donald D. Markstein. Art © DC Comics.